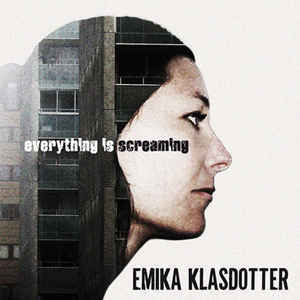 “Everything Is Screaming” is the debut album of Swedish singer/songwriter EMIKA KLASDOTTER. The featured tracks have carefully been chosen between tons of other songs written during a whole decade. EMIKA’s passion about what is close and real comes clear while listening to the fragile songs on the album – she sings about love, loneliness and the struggle within the common man. The emotions flowing through this record could easily be the same emotions flowing through a lifetime. The album is partially recorded in EMIKA’s home studio, by herself and Tommie Thunström. The other parts of the album was recorded on tape, in the studio of Tom Hakava (UpAndRunningRecording). EMMA NORDENSTAM, who is releasing her third album “Response To The Birddream” on the same date played cello and piano on some of the tracks. Cecilia Klingspor, Karl-Jonas Winqvist (BLOODMUSIC) and Johan T Karlsson (FAMILJEN) is also participating on this record. Very recommended for fans of the modern singer/songwriter -scene, suitable for anyone who enjoys the sound of ANNA TERNHEIM, CAT POWER, FERN KNIGHT etc. Categories: CD-Distribution, DISTRIBUTION, DISTRO STORE, Special Offers. Tags: Folk, World & Country.